LOS ANGELES (AP) -- The astronomers who claim to have discovered the 10th planet in the solar system have another intriguing announcement: It has a moon. The moon discovery is important because it can help scientists determine the new planet's mass. In July, Brown announced the discovery of an icy, rocky object larger than Pluto in the Kuiper Belt, a disc of icy bodies beyond Neptune. 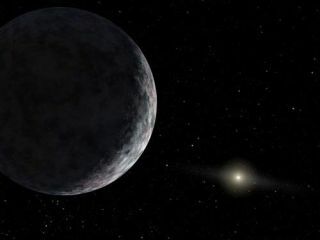 Brown labeled the object a planet and nicknamed it Xena after the lead character in the former TV series ''Xena: Warrior Princess.'' The moon was nicknamed Gabrielle, after Xena's faithful traveling sidekick. But the discovery of the moon is not likely to quell debate about what exactly makes a planet. The problem is there is no official definition for a planet and setting standards like size limits potentially invites other objects to take the ''planet'' label.